BLOG HOP, DAY 9: So your son or daughter is starting the college search process. This is a stressful enough time for him or her -- and for you. Now add to it the fact that you'll have to put colleges through an extra filter: which ones can best serve gluten free students. The question is...do any of them really know what they're doing? And if so, are there ample choices to make mealtime an enjoyable experience, not just another boring meal of the same "safe" options? 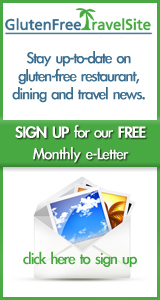 It is with these questions in mind that our sister website, GlutenFreeTravelSite, recently began welcoming reviews of college dining services, submitted by students on gluten-free diets. Gluten free college students follow the steps for Submitting a Review as they would for a restaurant, store, hotel, or resort, but they choose "college" when prompted for the type of establishment they're reviewing.